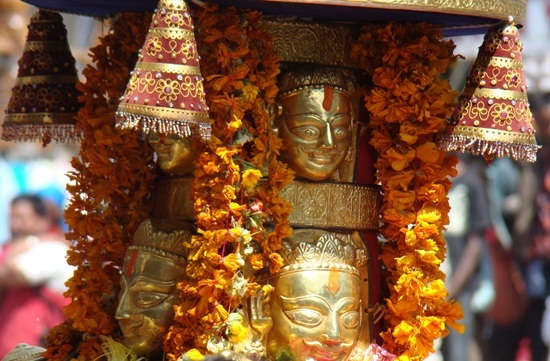 Why not take a drive to Kullu in Himachal Pradesh if you are flying to Delhi during Dussehra? Kullu, one of the Himalayan valleys in Himachal Pradesh, is a good escape to nature. The reason of recommending a drive to Kullu once Dussehra is over in Delhi and other parts of India is the Kullu Dussehra Festival. It is the best opportunity to experience divinity, festivity and natural beauty in the Himalayan region. We at IndianEagle take a walk through how Kullu Valley celebrates Dussehra. Dussehra in Kullu is one of the major festivals in the Indian state of Himachal Pradesh. The Himalayan hues of Himachal Pradesh look brighter during the colorful and cheerful celebration. When the Dussehra festivity comes to an end with the burning of effigies of Ravana all over the country, Kullu calls for celebrations. Dussehra in Kullu, the valley of living gods, begins with a spectacular procession of Lord Raghunathji, the presiding deity of the region. The sprawling Dhalpur Maidan is transformed into a temporary residence of Lord Raghunathji during week-long celebrations. Once in a year, the idol is ceremoniously brought from Sultanpur temple in the palace of the king of Kullu to the ground on Dussehra. The idol of Lord Raghunathji is carried on an ornate chariot with ropes which are pulled by devotees out of the faith that it will bless them with health and prosperity. Goddess Hadimba from Manali also joins the procession as it is a significant part of the celebration. When the chariot of Lord Raghunathji reaches the Beas River, fire is set to a heap of wood grass. This ceremonious fire marks the burning of Lanka after “Lanka Dahan”, a significant part of the Ramayana. It is followed by a ritual of sacrificing five animals. Once the sacrifice ceremony is over, Lord Raghunathji and Goddess Hadimba are brought back to their respective abodes. The procession is a grand show of the locals’ faith in divinity and zest for festivity. The procession comes to an end with an array of cultural performances in the evening. The entire valley soaks in merriment over cultural programs including folk dances. Various shows are staged at an open-air theatre for entertainment of art connoisseurs among the visitors. About 20 idols of the gods and goddesses from different parts of the valley join the procession adding to the gala. The only celebration that the Dussehra procession in Kullu can be compared to is Rath Yatra, a grand Chariot Festival in Odisha. The celebration in Kullu begins on Dussehra and continues for a week. During the week-long celebration, the idols are bathed, decorated, and worshiped. The air of Kullu Valley brims with cultural enthusiasm and divine enchantment during the Dussehra festival. Even nature rejoices in the festivity. Folk music and dance performances are held to entertain the visitors in fairs under the open sky. The handicraft lovers can shop for traditional artwork of Himachal Pradesh in the fairs. The procession of Lord Raghunathji, the cultural fairs, the folk dance performance by Gaddi shepherds, and Ram Lila, dramatic enactment of Lord Rama’s life are among the must-see attractions of Dussehra in Kullu. Though it does not match the grandeur of Navratri in Gujarat, Ram Lila in Delhi, Durga Puja in Bengal, and Dussehra in Mysore, it evokes the blessings of gods and goddesses in the Himalayas.